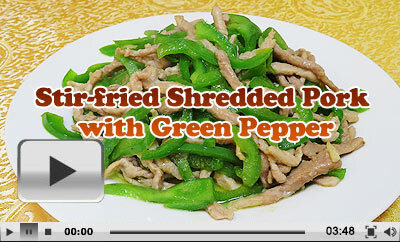 Characteristics: Stir-fried Shredded Pork with Green Pepper owns green-yellowish color. The pork shreds are quickly fried over high heat, so they taste very fresh and tender. Being one of the most popular home-style dishes of Sichuan Cuisine, the Stir-fried Shredded Pork with Green Pepper, Qing Jiao Rou Si in Chinese, now can be found throughout China because its main ingredients – lean pork and green peppers are easy to get, and the cooking way is quite simple. The dish can help to stimulate the appetite, and people usually tend to enjoy it together with rice. In the following recipe, the green sweet peppers (bell peppers) are applied so that the flavor is relatively light. For those who seek for hot and spicy taste, green chili peppers are suggested during cooking. Note: The amount of the ingredients and seasonings can be appropriately used according to one’s personal taste. 1. Clean the lean pork and cut into shreds in the direction of the grain. 2. Remove the pedicel and seeds of the green pepper. Clean and cut into shreds. 3. Discard the husk of garlic and peel the ginger. Cut them into small slices and put onto a dish. 4. Prepare some water starch. Preserve the pork: Combine the shredded pork with cooking wine, light soy sauce, white sugar, starch and salt. Let the mixture stand for 15 minutes. Fry the pork: Preheat the wok. Add cooking oil and heat it. Pour in the preserved pork shreds, fry over big fire for about 1 minute and pick out. Fry green peppers: Add more cooking oil and heat it until hot. Add in sliced ginger and garlic. Fry for 10 seconds until it gives out fragrance. Pour in the shredded green peppers. Stir-fry over medium fire for 30 seconds. Add some salt, and mix up. Add in the fried pork shreds. Stir to mix well with green peppers. Pour in water starch. Combine well and heat over big fire until the dish becomes a little sticky which shall take 20-30 seconds. Turn off the heat. Serve on an exquisite plate. The Stir-fried Shredded Pork with Green Peppers is cooked now. It looks very delicious. 1. Shredded pork is suggested to fry over high heat so that it will taste tender. 2. Green peppers should be fried over high heat quickly; otherwise, they will taste soft and withered. 3. To make the dish successfully, it is suggested to strictly obey the above recipe – frying the green peppers and lean pork separately, then combing them, or the freshness will be diminished. Rudolf and Alieke from Netherlands and a group from the USA including Ms. Diana, Ms. Mary joined our cooking class specially prepared in a local family during their tour with us in Xi'an. Diana told us in her feedback that it was a great surprise to take part in this class. She not only proposed to learn the dish - Shredded Pork with Green Pepper, but also joined other members in making dumplings. They really had fun there! Mr. David & Ms. Marilyn from USA took part in our China food tour in Xi'an. They were taken into a local family where they had a pleasant talk with the family and learned to cook two popular Chinese dishes - Kung Pao Chicken and Shredded Pork with Green Pepper from the host. They praised it their most mememorable experience of their China trip. Mr. Mitesh from UK & Ms. Menaka from India had a family visit in Xi'an during their 12-day China tour organized by our company. The hospitable hostess cooked about 10 dishes to entertain them. For the first time in her life, Menaka learned to cook her favorite Chinese dish Kung Pao Chicken & Shredded Pork with Green Pepper face to face from a Chinese housewife. Had this at a Holiday Inn in Beijing and it is fantastic! yes, it is delicious and very good to go with rice.